Analogue Alarm Clock is an exceptional quality Alarm Clock for your desktop. 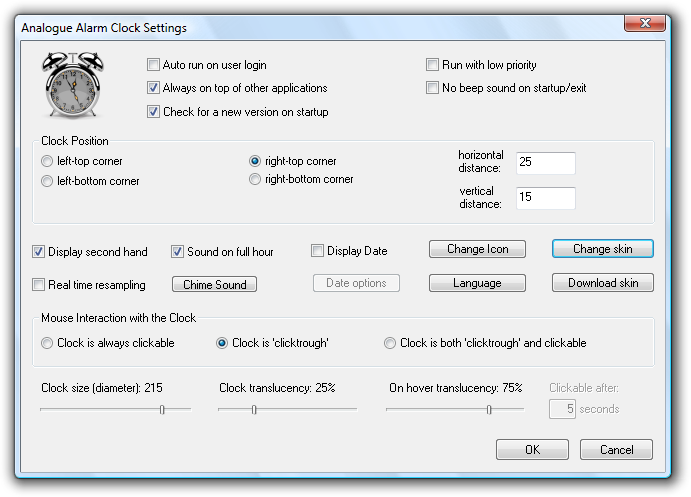 It offers multiple ways of integration with computer desktop, including two non obtrusive modes in which the alarm clock allows access to elements beneath the clock, even when "always-on-top" mode is utilized. 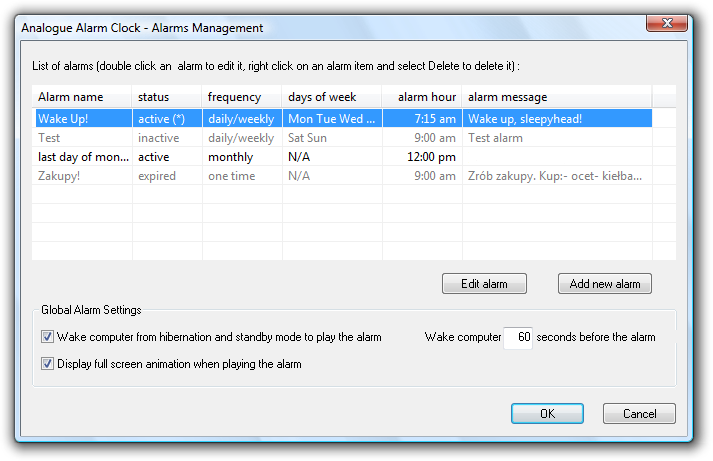 The alarm clock allows to set up and manage multiple alarms, with different alarm sounds, variable alarm length, and different scheduling for an alarm (daily, weekly, monthly, etc.) 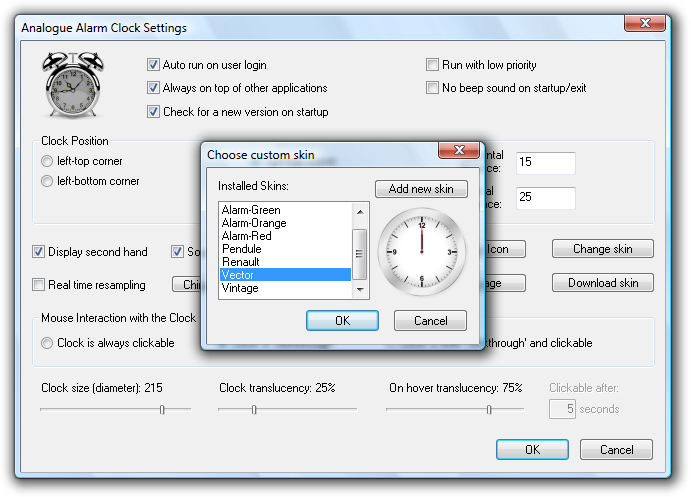 Additionally it can wake up your computer from hibernation mode in order to play an alarm (on Windows 7 and later please make sure you have your system configured to allow wake timers, if you want to take advantage of this feature). The Alarm Clock comes with eight beautiful clock skins and many more are available for free download. The other features include ability to set up custom chime sound, custom size and transparency levels, custom tray icon, and many more. Analogue Alarm Clock 1.0 works under Windows XP, Windows Vista, Windows 7, Windows 8 and Windows 10! Click on a button to download a free, fully functional 15-days trial version! Purchase a license for as low as $24.95! Click a button for more details. Make sure to check out additional skins and skinpacks for Analogue Alarm Clock! For more information go to the Analogue Alarm Clock's skins page. Also make sure to check our Tips and Tricks section to find out secret or undocumented features and to get other useful tips about Analogue Alarm Clock! This is the best looking clock that I have seen. - Tom, United States. My wife pointed out I already have a free clock with MS Windows Pro. I had to explain her it's puny compared to yours. - John, Australia. The software is very pretty and service is quality! - Dmitry, Germany. 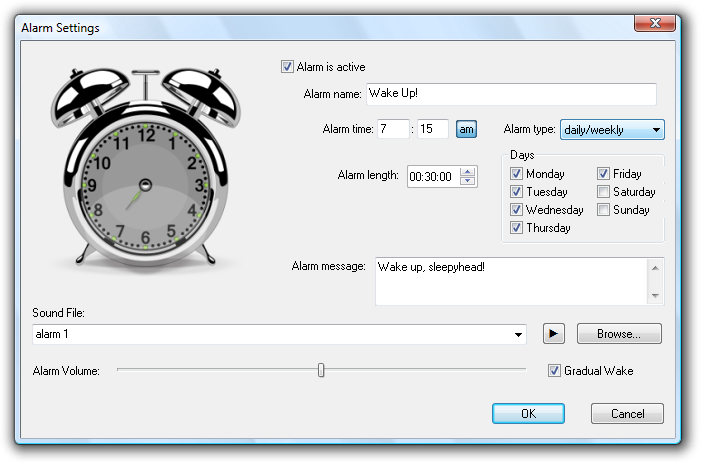 If you need a version of Analogue Alarm Clock that doesn't require administrative rights to install it on your computer you can get it by clicking here: Download.